I am thinking of buying a boat with this motor and am worried about it being a 2-stroke. I keep going back-n-forth between a 4-stroke outboard and the sportjet. I want it to last a long time, be reliable, get good mileage, light weight, and able to haul heavy loads. But I am really impressed by the performance on the Sportjet. I am looking for any information on this motor. I would like to here from all but am mostly interested in owners or users that have a lot of hours on theirs. Google phantom sportjet, you should get a site out of fairbanks Craig Compeaus (sp) they can send you a video and give you all the info you need on the motors. Mercury also has a site. I do not own one but I will, most guys love them! I want it to last a long time, be reliable, get good mileage, light weight, and able to haul heavy loads. For a long lasting, reliable, economic, lightweight engine the Sportjet is hard to beat. I have a 200 Optimax jetdrive in my Jetcraft Extreme Shallow and it does a great job. The only big thing I don't like about it is the noise. Sportjets are very noisy. I wear earplugs and it makes it much more comfortable. As far as power-to-weight ratio there is not a better unit than the Sportjet. Jetcraft is going to start installing a Yamaha 4-stroke 160 horse jetdrive in some of there units and it will be interesting to see how they compare. The 4 Stroke Yamaha is suppose to turn 10,000 rpm which might make it a bit of a noise maker too? The Sportjets turn around 5,650. You might check out myboatforum.com for some more information on the Sportjet. This is the thread with the complete technical report on the 200 Optimax Sportjet. I have an 03' 19' Thunderjet Envoy with the 175hp sportjet. Aside from getting some water in the fuel I have had no problems with the motor. I don't know how many hours it has on it but I can tell you it gets used. The main reason I chose the sportjet was it allows alot more room for fishing vs a V8. It is a little noisy, but I knew that when I bought it. It isn't running when I'm fishing so that was a tradeoff I was willing to make. The sportjet is also much lighter. I have checked out the Phantoms as well as followed them on the river. There isn't another boat out there that could compare with its shallow water running ability if you ask me. How shallow will they run? I have checked out the Phantoms as well as followed them on the river. There isn't another boat out there that could compare with its shallow water running ability if you ask me. Guess you have not seen the Jetcraft Extreme Shallow or the Jetcraft Extreme Duty in action, they will run just as shallow. Here is a link if you want to check out the ED in action. The video link is at the bottom of the page. The dealer I bought my boat from said I need 5-6" for my boat. I don't have the nuts to try it. However I watched a Phantom go through 3" without hesitation or grinding on the gravel bottom. The boat that followed him was an Alumaweld similar to mine, he stuck it about 50 yds past the point his boat would float. I was wise/lucky enough not to follow either of these boats. I watched the video link that was posted, I have seen it before. I must say that it is impressive however I don't beleive that boat could maintain momentum enough to go up a river consistently that shallow. You could hear the motor wind up/cavitate and the bottom of the boat sliding across the gravel. I just can't see how any boat with a V bottom of any sort could compare to a Phantom. However a Phantom would not slide across the gravel as queitly without the same skin on the bottom. Then again, this is just my opinion. I suppose I should clarify that the boat I am speaking of is a Phantom Sportjon. I don't beleive that boat could maintain momentum enough to go up a river consistently that shallow. I just can't see how any boat with a V bottom of any sort could compare to a Phantom. However a Phantom would not slide across the gravel as quietly without the same skin on the bottom. I should clarify that the boat I am speaking of is a Phantom Sportjon. Shallow water boats run all day long in water that shallow. The Sportjon and the Extreme Shallow can run in 2-3" of water all day long. You can get the UHMW bottom on the Sportjon, Extreme Duty and the Extreme Shallow. 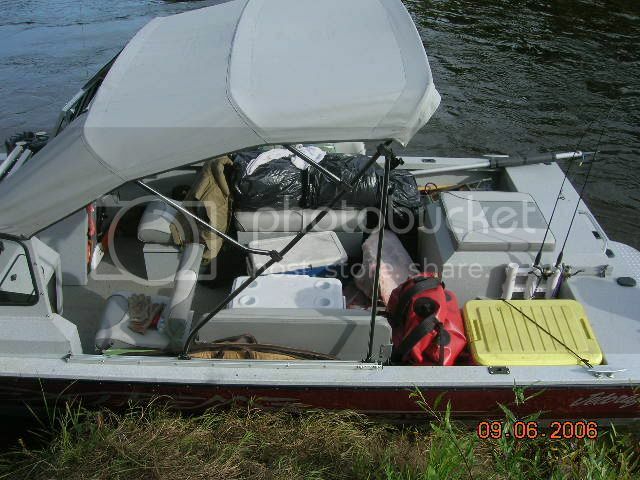 You are right that a V-bottom boat wont go where they will. The Extreme Shallow and Extreme Duty have a 8 degree bottom and the Sportjon has a 7 degree bottom. Normal jetboats have 12-18 degree bottoms. There is a new class of jetboats being built today and they will almost give a airboat a run for the money. I don't know how they will ever give an airboat a run for the money but if its not as stinking noisy I would be interested in checking it out. You would be very surprised with the elevated intake tunnels how far they will go. Granted not as far as a airboat but much more user friendly. The Mercury Sportjets are noisy but nothing compared to a airboat. The new Yamaha that Jetcraft has just started installing may be even quieter since it is a four stroke but I have not heard for sure. Just curious, what boat was the 50"er in? 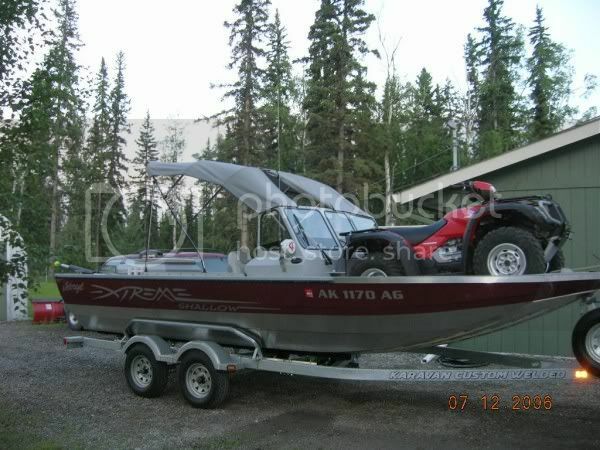 The 50" moose was in a 2006 Jetcraft Extreme Shallow with a 200 Mercury Optimax jetdrive. Packed the whole moose in the bow from where he was shot to camp about 15 miles downriver then after skinning the weight was distributed a little better along with all our gear for the trip home. A guy in my neighborhood has a sportjet (SeaArk Predator) and loves it. He told me he has about 200 hours on it with out any problems . If a large cargo capacity is important to you, I believe the SeaArk Predator has an edge over the Phantoms and Jetcrafts. Thanks for all the posts. The boat I have been looking at is the Jetcraft Shallow Extreme. I looked pretty hard at the Sport Jon but it did not have the layout I was looking for. The Jetcraft has the windshield forward enough to have the bench seats so my family can cruise around with me. But then still leave enough room in the front to take a load (4-wheeler, moose, gear, fuel, etc.). 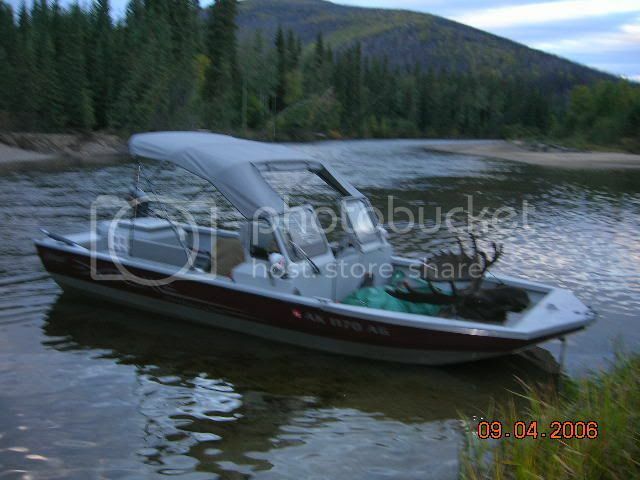 If you take the bench seats out you can have even more room under the canopy for that long moose hunt. You do have room under the canopy in the Sportjon, but with my wife and three kids, seems it would be cramped and little less comfortable than the Jetcraft. The Sportjon has the windshield mid way back and behind the front seats is the storage that is on all three sides of the doghouse. Yes you can put seats on top of the storage but I have set in them and if you are the person in back, your knees are in the driver and passengers back. If I were single, the Sportjon might be the boat for me. Another thing to consider: the Jetcraft has a stock 3/16 inch hull and has an optional 3/16 steel plating around the keel and tunnel. Thats 3/8 of an inch of protection in the most vulnerable spots. The Sportjon has a stock 1/8 inch hull and the plastic 1/4 UHMW around the keel and the tunnel. Both are very good, but I would think with the thicker aluminum bottom and steel plating would have stronger protection from rocks. Will take a look at the other forum link. You can't go wrong with the XS. If you are not in a hurry I have heard that Jetcraft is going to start installing 160 horse four-stroke Yamaha Jet-drive in the XS. It might be nice to compare the Optimax with the Yamaha before you put down the money. The 160 might be a little underpowered compared to the 200 horse Optimax but they might be worth a look. I just got back from a hunt and came across a guy with the sportjon and 200 optimax sportjet. a few from our hunting party rode in it for 10 or so miles of river. 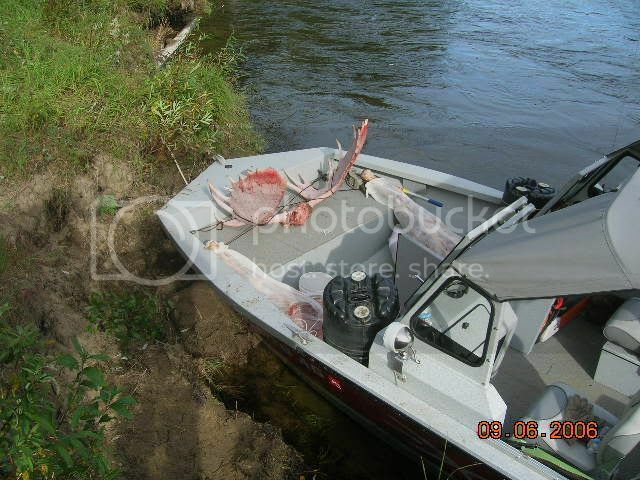 they report that the boat was pretty loud and "buzzy". i would try to go for a ride before i purchased, especially with the kids you mentioned would be with you. of course a pair of earmuffs could cover that i guess. how much have you found this boat for? i see info for it on the boatshopak website, but no price given. also, no max load rating. have you found this info in your searching? At The Boat Shop the Jetcraft XS runs about $34,000. Thats with Canopy, bench seats, Water sep., sand trap, heater, etc. Pretty much everything to make things comfy. Where did you guys here about the Yamaha motor. Really curious about this. I have also heard good things about the SeaArk Predator. Not a bad looking boat. The link on the 200 Optimax was a wealth of info on this motor. It seems that even though it is a 2-stroke, the technology that they use in this motor makes it more reliable (similar to the 4-stroke) than the conventional 2-stroke outboards. This motor seems to be an option and in some cases standard on almost all jet boat manufacturers. That says a lot about this motor!